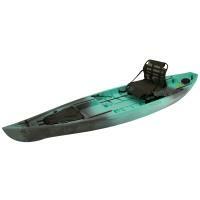 By combining excellent stability, high-performance paddling, and an open deck, the NuCanoe Pursuit Fishing Kayak provides the ultimate kayak fishing experience without compromise. NuCanoe's revolutionary CustomHeight 360 pinnacle seat provides incredible lumbar support without impeding your natural range of motion for paddling and fishing. Shipping Notice: An additional shipping charge of $99.99 each will apply. By combining stability, high-performance paddling, and an open deck, the NuCanoe Pursuit Fishing Kayak provides the ultimate kayak fishing experience without compromise. At 35 inches wide, the Pursuit is one of the most stable fishing kayaks available. NuCanoe's revolutionary CustomHeight 360 pinnacle seat provides incredible lumbar support without impeding your natural range of motion for paddling and fishing. 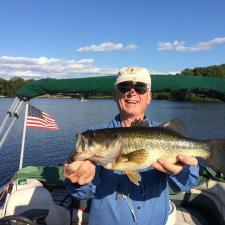 Some integrated features include four internal rod tubes, two cup holders, two flush rod holders, gear vault, and plenty more space for your tackle and other gear. The Pursuit offers a total of 86 inches of freedom tracks on the bow, deck, and stern so you can add as many accessories as you want. If you enjoy paddling while standing or fly fishing, you need the excellent stability that comes with the NuCanoe Pursuit Fishing Kayak! 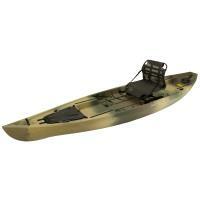 The NuCanoe Pursuit Fishing Kayak is made in the U.S.A.
Can you stern mount an electric motor on this kayak? 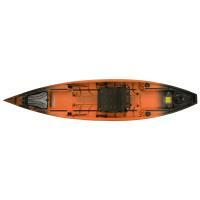 Yes, these kayaks actually have a hole designed for the armature for a Minnkota trolling motor.